What makes a vegetarian diet healthy? Thirty years ago, nutritionists warned against vegetarianism and veganism; today, it is clear that they are a healthy, beneficial way of life. What are the advantages and potential risks? In recent years, there has been an increase in the number of vegetarians in the population. People are adopting this lifestyle for many different reasons: religious belief, moral considerations, environmental protection, and health benefits attributed to vegetarian nutrition. But is there an actual health benefit? Let’s begin with the history – three decades ago, the American Dietetic Association, considered the leading body in establishing dietary recommendations, expressed doubts about the ability of a vegetarian diet to provide one’s nutritional needs, and also questioned its health benefits. But the evidence collected in research over the past thirty years has demonstrated its advantages and convinced the organization to alter its position. The knowledge accumulated since enables us to better understand the link between nutrition and disease, and, ultimately, give vegetarianism a boost. There are a variety of dietary regimes under the “vegetarianism” umbrella: Pescetarians, who eat fish, dairy products, and eggs – but avoid red meat and poultry; lacto-ovo vegetarians, who eat dairy products and eggs but avoid red meat, chicken, and fish; and vegans who abstain from any animal product including milk, eggs, and sometimes even honey. Despite the differences between them, this article will treat all of the above as a vegetarian diet, to avoid any misconceptions. The Dietetic Association’s latest position paper on this issue, published in 2009, states that well-planned vegetarian and vegan diets that meet all nutritional needs are considered healthy and have advantages in preventing and treating certain diseases. A good diet plan can be adapted to the entire population, including pregnant and lactating women, toddlers, adolescents, and even athletes. The Association developed these recommendations following a review of extensive research literature that included only articles that met very strict methodological and technical standards, which ensured their validity. The Benefits of a Vegetarian Diet? Vegetarian nutrition is typically based on cereals, fruits, vegetables, legumes, and nuts. Such diets tend to contain less saturated fat and cholesterol, and more dietary fiber, magnesium, potassium, vitamin C and E, folic acid, natural antioxidants (carotenoids and flavonoids), and other active plant ingredients (phytochemicals). Most of the health benefits of vegetarian diets appear to stem from their effect on our body weight. Many studies show that vegetarians have a lower BMI (Body Mass Index – a measure of body fat) compared to non-vegetarians, and that BMI increases with meat consumption, in both men and women. The lower body weight among vegetarians probably arises from the high consumption of food rich in dietary fiber but low in calories, such as fruits and vegetables. Obesity is a major risk factor for type 2 diabetes, cardiovascular disease, and certain types of cancer. Studies have found that the incidence of type 2 diabetes is lower in vegetarians than meat consumers. In addition, consumption of red meat and processed meat (mainly sausages and bacon) was found to be a major risk factor for type 2 diabetes, beyond the effect of obesity itself. In terms of cardiovascular disease, vegetarians face a lower risk of dying from heart disease than meat eaters, regardless of obesity. In other words, the vegetarian diet has other aspects that influence morbidity and mortality. 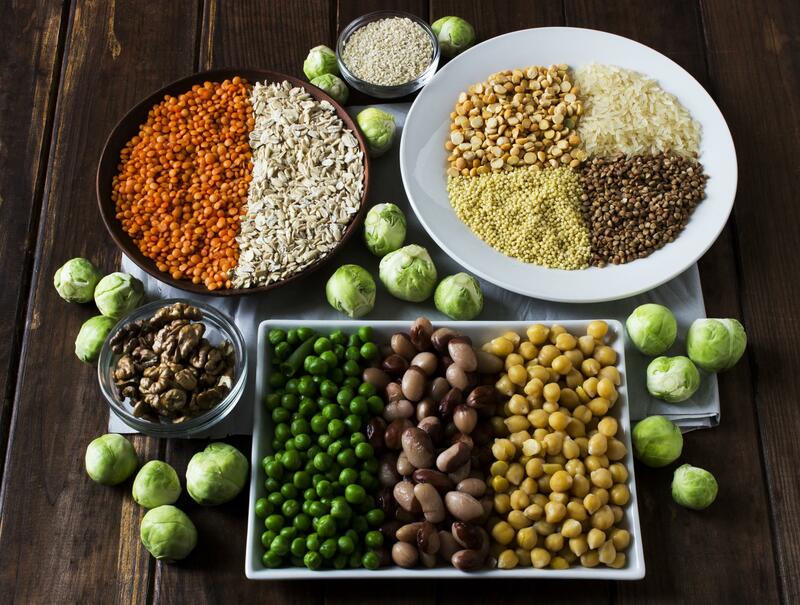 The beneficial effects of vegetarian nutrition are probably due to increased intake of polyunsaturated dietary fiber, the antioxidant folic acid, and phytochemicals, all of which are found in vegetables, whole grains, legumes (mainly soybean), and nuts. Their link to reduced type 2 diabetes risk is well documented. A vegetarian diet is also associated with lower levels of the “bad” cholesterol (LDL) because dietary fiber lowers cholesterol. Soy contains substances called flavonoids, which also reduce bad cholesterol levels and function as antioxidants. Legumes, nuts, whole grains, and vegetable oils all contain substances called sterols, which reduce the absorption of cholesterol from food. In addition, flavonoids and other phytochemicals positively affect the body at various stages of the development of cardiovascular disease. Furthermore, plant foods are rich in potassium and magnesium, as well as in certain fatty acids and antioxidants that can all lower high blood pressure and thus fight against cardiovascular disease. The findings also suggest that vegetarians have a significantly lower risk of colon and prostate cancers compared to non-vegetarians. In other common cancers, however, there were no differences between vegetarians and meat eaters. Many studies have found that consumption of red meat and processed meat increases the likelihood of colon cancer. High consumption of fruits and vegetables reduces this risk, probably due to their high dietary fiber content. It is also known that fruits and vegetables contain antioxidants that hamper cancer cells’ ability to thrive. Among them are vitamin C, carotenoids, flavonoids, substances from onions and garlic, or lycopene from red fruits. Vegetarians, then, are less likely to die from cardiovascular disease and certain types of cancer. But there is other evidence to show vegetarians differ from meat eaters in other ways that may also affect their health. Among these, vegetarians tend to adopt a healthy and active lifestyle, are less overweight, smoke less, and drink less alcohol. It is also important to emphasize that most of the studies that examined the benefits of vegetarian diets were epidemiological studies that are based on a correlation between different factors, and do not examine cause and effect. Therefore, they can only point out a relationship between two things, without proving that one caused the other. To date, it has been scientifically proven that consuming high amounts of red, especially processed, meat increases the risks of mortality over time, of cardiovascular disease, colorectal cancer and other cancers, and type 2 diabetes. And today’s bottom-line recommendation is to reduce their consumption. Avoidance of meat has certain risks, especially for vegans who consume no animal products at all. Meat is an excellent source of protein, vitamins A, B1, B6, and especially vitamin B12, as well as iron and zinc. The iron found in meat is better absorbed than that from a plant source. It is very important for vegetarians and vegans to ensure they get an adequate intake of B12, as a supplement or from enriched foods, as this vitamin is found only in animals. Vitamin B12 deficiency is common in vegetarians and vegans and poses a real risk to them. The danger is even greater because the vegetarian diet is rich in folic acid, which may mask a B12 deficiency. A deficiency of this vitamin can increase homocysteine levels, which can increase the risk of cardiovascular disease and dementia. B12 deficiency is related, among other factors, to other neurological problems, especially in children with vegan mothers who did not take supplements. Beyond ensuring B12 intake, people who opt for a vegetarian or vegan lifestyle should make sure they consume enough protein, omega-3 fatty acids, iron, and zinc (which are better absorbed from animal foods), iodine (from fish sources), calcium and vitamin D (especially for vegans who do not consume milk and its products). In summary, the discussion of the superiority of one nutritional regime versus another does not serve the public. Perhaps not all health authorities agree on the proportion of meat in the diet, but all agree that the consumption of sugar, processed grains, and saturated and trans fat should be limited. In addition, today there is general agreement that proper nutrition should include many fruits and vegetables, whole grains, legumes, and nuts. Achieving these goals is more important than the question whether proper nutrition should include moderate amounts of dairy products, eggs, fish, and meat. Vegetarian diets are generally healthy and, in many ways, preferable to meat-based diets. Many studies have proven the associated significant reduction in the incidence of serious diseases, some of which can be fatal. However, as with any good thing, a balanced diet requires care and caution and the inclusion of all substances the body needs, especially vitamin B12. Naturally, it is always good to maintain a healthy lifestyle. #theme.dating[If you are one particular of those guys who loves to be degraded by a beautiful lady, the Russian escorts are just waiting for you. If you wrote instead "vegan lifestyle should make sure they breaths enough air"
"To summarize, the discussion of the superiority of one diet versus another does not achieve anything for the general public" Not true at all! allow me to rewrite this statement in more realistic way. Quote 5 - rewritten: """
To summarize, the discussion of the superiority of one diet versus another does not achieve anything for the food companies, the drug industries, and the medical profession. "there is general consensus that proper nutrition should include many fruits and vegetables, whole grains, legumes and nuts. Achieving these goals is more important than whether proper nutrition should include moderate amounts of dairy products, eggs, fish, and meat" Consensus from who? from corporations whom has conflicts of interests? proved only correlations, not cause and effect. But in this case, it depend who are the vegetarians group. "the current article will treat all of the above as a vegetarian diet, to avoid any misconceptions."